An Advanced Extremely High Frequency communications satellite relays secure communications for the United States and other allied countries. The concept of the geostationary communications satellite was first proposed by Arthur C. Clarke, building on work by Konstantin Tsiolkovsky and on the 1929 work by Herman Potočnik (writing as Herman Noordung) Das Problem der Befahrung des Weltraums — der Raketen-motor, which described the use of space stations for radio communication and observation of Earth. In October 1945 Clarke published an article titled "Extraterrestrial Relays" in the British magazine Wireless World. The article described the fundamentals behind the deployment of artificial satellites in geostationary orbits for the purpose of relaying radio signals. Thus, Arthur C. Clarke is often quoted as being the inventor of the communications satellite and the term 'Clarke Belt' employed as a description of the orbit. The first artificial satellite used solely to further advances in global communications was a balloon named Echo 1. Echo 1 was the world's first artificial communications satellite capable of relaying signals to other points on Earth. It soared 1,600 kilometres (1,000 mi) above the planet after its Aug. 12, 1960 launch, yet relied on humanity's oldest flight technology — ballooning. Launched by NASA, Echo 1 was a 30-metre (100 ft) aluminised PET film balloon that served as a passive reflector for radio communications. The world's first inflatable satellite — or "satelloon", as they were informally known — helped lay the foundation of today's satellite communications. The idea behind a communications satellite is simple: Send data up into space and beam it back down to another spot on the globe. Echo 1 accomplished this by essentially serving as an enormous mirror, 10 stories tall, that could be used to reflect communications signals. There are two major classes of communications satellites, passive and active. Passive satellites only reflect the signal coming from the source, toward the direction of the receiver. 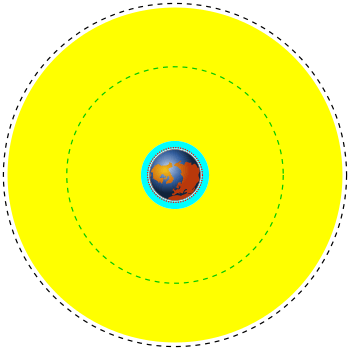 With passive satellites, the reflected signal is not amplified at the satellite, and only a very small amount of the transmitted energy actually reaches the receiver. Since the satellite is so far above Earth, the radio signal is attenuated due to free-space path loss, so the signal received on Earth is very weak. Active satellites, on the other hand, amplify the received signal before re-transmitting it to the receiver on the ground. Passive satellites were the first communications satellites, but are little used now. Telstar was the second active, direct relay communications satellite. Belonging to AT&T as part of a multi-national agreement between AT&T, Bell Telephone Laboratories, NASA, the British General Post Office, and the French National PTT (Post Office) to develop satellite communications, it was launched by NASA from Cape Canaveral on July 10, 1962, the first privately sponsored space launch. Relay 1 was launched on December 13, 1962, and became the first satellite to broadcast across the Pacific on November 22, 1963. Beginning with the Mars Exploration Rovers, probes on the surface of Mars have used orbiting spacecraft as communications satellites for relaying their data to Earth. The orbiters were designed for this relay purpose to allow the landers to conserve power. The Orbiters with their solar power arrays, large antennas and more powerful transmitters enable them to transmit data to Earth with a much stronger, and as a result, clearer signal than a lander could manage on its own from the surface. Communications satellites are used for military communications applications, such as Global Command and Control Systems. Examples of military systems that use communication satellites are the MILSTAR, the DSCS, and the FLTSATCOM of the United States, NATO satellites, United Kingdom satellites (for instance Skynet), and satellites of the former Soviet Union. India has launched its first Military Communication satellite GSAT-7, its transponders operate in UHF, F, C and Ku band bands. Typically military satellites operate in the UHF, SHF (also known as X-band) or EHF (also known as Ka band) frequency bands. ↑ "Communication: How the rover can communicate through Mars-orbiting spacecraft". Jet Propulsion Laboratory. Retrieved 21 January 2016. ↑ Connected | Maritime. Iridium. Retrieved on 2013-09-19. ↑ "GSAT-14". ISRO. Retrieved 16 January 2014.